Mailing bags are generally used for marketing mailers and product delivery. Made from a few different materials and found in a wide variety of shapes, sizes and styles such as paper envelopes, vinyl and canvas mailers and plastic mailing bags. Mail order bags are manufactured having in mind the what products need to be mailed mailing bags provide more than just safely transporting your packages. From protection to promoting your company. Other than serving your personal mailing needs polythene mailers are becoming very popular choice for today's business marketing. For a low cost alternative postal bags and courier sacks offer simple but effective protection. They are much lighter than paper envelopes, can be plain or coloured and with or without a pre-printed address window. Ideal for posting magazines and catalogues. Maybe the most common type of mailer, envelopes come in a wide range of colours, sizes and materials. Mailing envelopes can be used to send greetings cards, letters or anything really. They can be bubble padded like the Jiffy mailers, security envelopes can also be found a they provide tamper evident self seal strip to ensure it is only open by the right person. As soon as you add an item to your shopping basket check the delivery costs! You may think you're getting a great deal and then by hit by a delivery charge at the checkout stage. Some mailing bag retailers offer cross-subsidised prices on certain products in the hope of catching you out with the extra delivery charge; others offer fairer prices with free standard delivery. Don't be fooled and be sure delivery charges are shown upfront before you buy. (2) Buy your mailing bags from a reputable, accountable source. When you source your supplier for your mailing bags and polythene mailers you should be careful to select a reputable well established retailer who is also a UK or European manufacturer. Many (particularly purely online) retailers are simply stockists of mailing envelopes which means that they often will import cheap and badly made mailing bags from countries where manufacturing standards are much less stringent. The product may also suffer during transit, particularly if it is biodegradable in nature and polythene itself often weakens, warps and perishes when transported in warm or unprotected conditions. The use of far-off manufacturers may often allow stockists to sell marginally cheaper products. However this is clearly false economy for businesses wishing to deliver goods, because for every badly made bag there is a risk of splitting and subsequent damage to the goods in transit. When faced with the option it's often worth paying a very small premium to ensure your goods are made to the appropriate UK BSI standards and are therefore more likely to withstand the pressures of transit. The more valuable the goods inside the courier bag or mailing bag, the more important this is. If you seem to be getting a deal that's too good to be true, then it probably will be! (3) Cut out the middle man - buy mailers direct from an online manufacturer. Most of the big postal envelope and mailing bag manufacturers now offer online sites. Some are very basic and frustrating but a few of the industry leaders have good sites so you can now buy direct from them rather than a trader and will normally get a much better deal. If you've already decided from (1) that you want your mailers to be of a sound quality then logic dictates it's best to by from a UK or European Manufacturer. Price isn't the only reason to buy from a manufacturer; the wealth of experience and knowledge of how to make good quality bags comes in to play evaluating stock bags too. A retailer that has no polythene bag manufacturing base will have sales staff that are not equipped with the same breadth of knowledge as a company steeped in polythene bag manufacturing history. Check the 'About Us' page - does the company manufacture too? Has the company been around a while? (4) Don't evaluate a site by its colours or name - ask has the site been invested in? 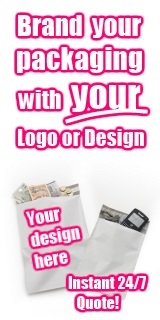 You may not like the particular colours, look or branding of a mailing bag website but try to look beyond this to determine if it is smart and clean and well designed; if it has then you can bet that it has invested serious money in the design of it's site and it is more likely to be a serious company that is serious about what it does. Don't use clunky websites with insecure shopping carts or sites that don't allow you to buy online and steer clear of potentially unscrupulous ebayers (if you do use ebay ensure you have checked the sellers reputations thoroughly and are payment-protected or there may be no come back). (5) Look at customer ratings and reviews - the real ones! Some of the bigger, better and cheaper sites stocking mailing bags offer Google Checkout as a payment option. This means that their service is independently reviewed by Google users which prevents the use of carefully selected or 'exaggerated' customer testimonials. Look for a Google Checkout service rating and this will give you a good and tamper-proof idea on whether to steer clear or whether you've hit the jackpot. Specialist supplier of mailing bags, polythene mailers, courier bags and plastic envelopes. Discount ranges and high-impact ranges for all your mail and postal packaging needs. Find more about the different types of polythene mailers, mailing bags and courier sacks available for posting packed items. With selected information on where to buy featured mailers and other types of mailing envelopes. Courier Sacks offers a big selection of standard courier bags and mailers for all you bulk mailing needs, find top suppliers with lots of options on mailers at discounted prices. Mailing Bags Direct is the perfect source for all your mailing needs. Get all your mailing bags, envelopes, courier bags and much more from a wide range of mailing options, al direct from manufacturers and wholesale suppliers. To protect your good when posting make sure you visit Bubble Mailers for a vast selection of bubble mailers and protective packaging, with prices bellow the average and bulk buy options. For all your needs for postal boxes, mailing boxes, oyster cartons, cardboard envelopes Postal Boxes is the right place to go. Specialised in finding wholesale suppliers and manufactures of cheap but high quality mailing packaging. Specialist supplier of polythene mailers, plastic envelopes, mailing bags and mail order bags. Buy high quality mailers from selected UK suppliers with free delivery. Buy all your mailing bags and polythene envelopes direct from the manufacturer at discounted prices. Buy mailers in bulk a pay even less. Free packaging directory where businesses can add their mailing bags, polythene film and biodegradable packagin product listings for free. Interesting best of the web directory with links to useful mailing bags websites. If you care about the environment and think polythene is a bad choice, you will like to hear that there are environmentally-friendly alternatives to plastic mailers that bring all of the same benefits and features of the polythene mailing bags. These mailers are produced using a thin, high density plastic that is totally degradable meaning they are quickly broken down and therefore better for the environment. These eco-friendly alternatives are definitely the way to go if you have any environmental concerns about the use of polythene mailers. For more information and a list of exclusively biodegradable mailing bag suppliers please see our biodegradable bags section.